A few days ago, Elijah had some bites appear on his arm and back. We put some anti-itch ointment and thought that would help. But the bite on his back got worse and very painful. Today we went over to visit our friends, the Lawsons. 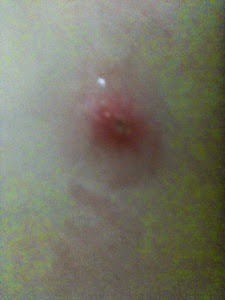 Jennifer, who is a nurse, thought that it looked like there may be a mango fly larva in his skin. Apparently mango flies like to lay their eggs in skin, then the eggs hatch and the worm-like larvae burrow. She covered the sores with neosporin and a bandaid in order to sufficate the larvae. After about 20 minutes she sterilized a needle and opened the sore on his back. She pressed a bit and squeezed out a little worm-like mango fly larva about 1cm long. It was no longer living since it had been suffocated. One of the sores on his arm was already open and doesn't seem to have a larva, but the other one on his arm had another very small, newly hatched fly larva. Since that one was so small it was a bit more difficult to remove, but the area around it was not as irritated. 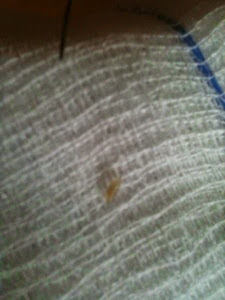 Elijah was very brave through it all and only felt a little sick after he saw the worm-like fly larva was in his back. I now know what the mango fly looks like and will be ready to swat any that I see. In our 11 months here, this is thankfully our family's first experience with this pesky fly. I am also thankful that God provided us with a friend to help with the extraction before it caused Elijah too much pain. Life here is always an adventure!